Great app, has some games, word of the day ect. Very cool. My only criticism is that there is no gender identification for nouns. Problematic if you are trying to translate accurately, not just word to word. Fix this please! Why do nouns not include the gender? 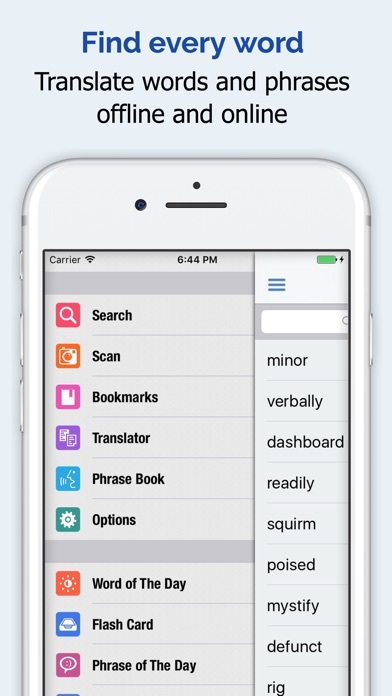 This seems like an obvious and necessary feature any language dictionary should have. Love this App but there is too much British English in translations. Would like to see a version more suited for the north America. 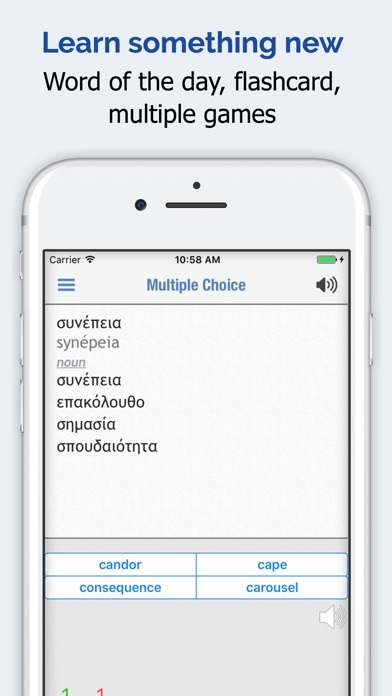 This is the best of the Greek dictionary apps. I'm living in Athens for the year and use it all the time. Note that it is English, not American, so some of the English requires further translation if you're from the US. (Minor inconvenience for such a useful tool.) The new phrase book is useful, both as a resource and as a study aid. This is an excellent App. It does everything it claims. I upgraded to the full paid version and have not regretted it. Ευχαριστώ πολύ καλά ! When it's in scan mode, it doesn't seem to translate the whole sentence or at least the words I'd like translated. Overall it's a great app but just the scanning needs an update. Great app. Especially like the random flash cards. I wish it had genders and verb conjugations. Great little app for very little cash. It has quickly become my go to translator in a market swamped with poorly designed copies. 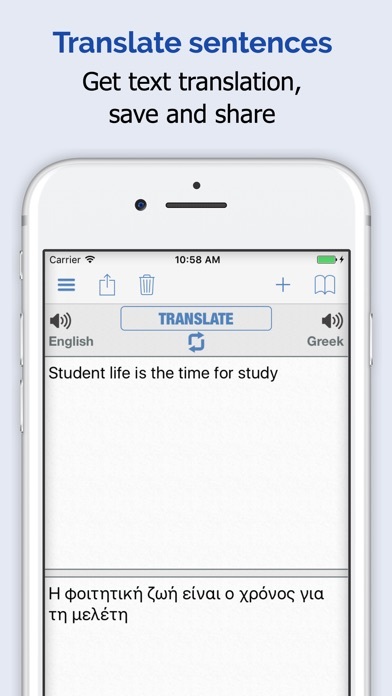 If you are interested in learning Greek or traveling to Greece, this app is very helpful and quite accurate. I use it frequently. This has a decently large number of entries, but too many of them provide obscure or uncommon translations of what should be ordinary words. There are also often far too many alternatives provided, with no indication of usage for each one. 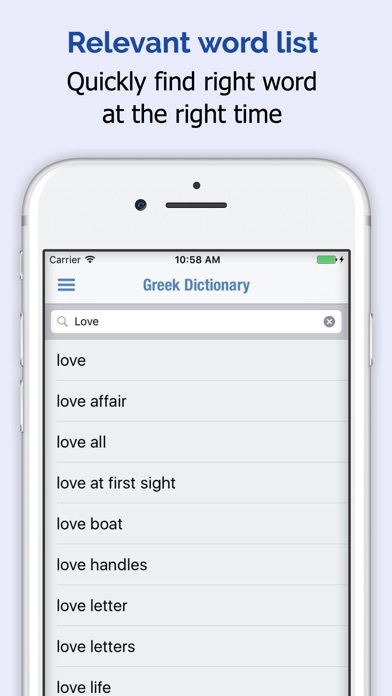 And be sure to use correct accents when looking up Greek words, otherwise you will not find what you're looking for. 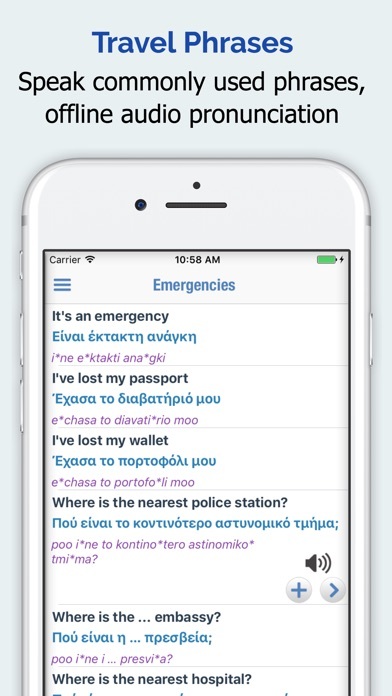 All that said, it's a good effort and among the few really useful Greek-English dictionaries for iOS for someone who has a decent grasp of grammar and syntax but needs to build vocabulary. Four stars for that, which would be three if there were any competition. A total waste of money. Doesn't work as advertised/expected. Please include the articles for each noun. Need to know if word is masc. fem. or neuter. I'd give 5 stars if this was added.